Directly available from this page are the one-off reports and articles produced by the Society. Our newsletters, AGM reports and Annual Reviews are available on other pages. The Newsletter is emailed or posted to all members every two months; the latest is here. In addition, we produce an Annual Review, which is posted to all our members. 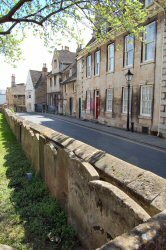 The newsletters contain a mixture of Society information, including details of forthcoming events and the Journal contains articles about some of the interesting and often unexpected facets of Stamford’s history. Archive documents, including AGM reports comprising the minutes of the previous year's AGM, the Chairman's report and the Treasurer's report and accounts from 2008 onwards can be accessed from the archives page. Henry Traylen - an article about this architect, written when the Society applied to get two of his buildings listed. A reprint of an article in Lincolnshire Life from 1972, reproduced in the 2008 Newsletter. A booklet celebrating the town and including a history of the Civic Society, produced in 2007, as a celebration of the 40th anniversary of Stamford being designated a Conservation Area. Paving the Way, a report to Lincolnshire County Council about the state of the pavements in the Conservation Area.